For most visitors to the holiday hotspots of Spain’s Costa del Sol the most popular day trips are to the white village of Mijas and Ronda or along the coast for a visit to Gibraltar. Whilst these are well worthwhile excursions, especially for first time tourists, there’s another that I’d highly recommend which you’re unlikely to see on the promotions board of your resort’s travel agencies which will especially appeal to those of you looking to escape the concrete jungle of the coastal strip and discover one of Spain’s truly marvellous natural attractions which lies less than 60km inland from the city of Malaga. Lying on the southern part of the Embalse del Guadalhorce (reservoir) is the ‘Garganta del Chorro’ which is a spectacular gorge whose walls reach an impressive 400 metres in height. 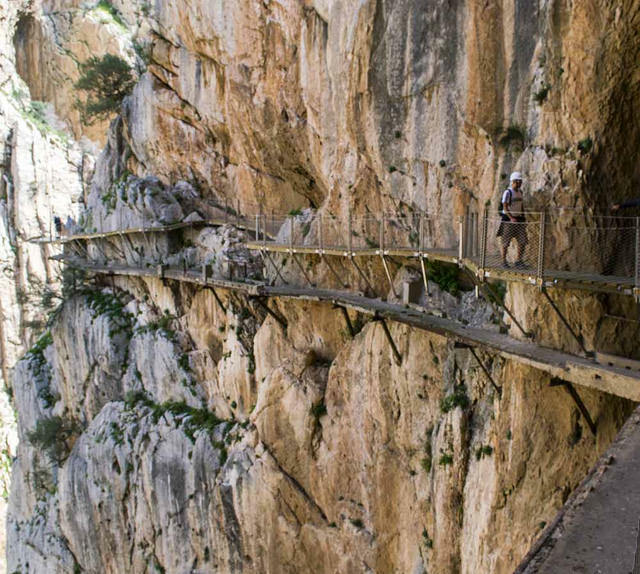 Running along the walls of the gorge is a narrow pathway attached precariously to the rock face which is known as ‘El Caminito del Rey’. Historically this path was built in the 1920s to provide a way for workers at neighbouring hydroelectric power plants to move between sites. It was named ‘the King’s Pathway’ after King Alfonso XIII walked its length when officially opening the Conde del Guadalhorce dam in 1921. The walkway is a mere 1 metre wide and stands 100 metres above the river below it. Not surprisingly the world’s adrenaline junkies learned of its existence and added it to their bucket list but without proper maintenance it soon fell into disrepair and became practically impassable over the years although the area grew as a mecca for serious rock climbers. In spite of the closure of the ‘caminito’ for safety reasons many years ago and the threat of significant fines for attempting to access it there were still some visitors who considered themselves infallible which led to the death of five people who fell from the Caminito del Rey forcing local authorities to make it completely inaccessible. However, those same authorities, realising the notorious pathway’s potential for attracting tourists to the area, have been investing significant sums of money into restoring the Caminito and making it safe for fearless tourists to walk along. And it looks like they were right. The pathway was reopened at the end of March 2015 with no charge for visitors during the first six months but with restricted numbers being able to access the walk. Available places were snapped up immediately so if you want to walk the Caminito any time soon you’ll need to keep checking the bookings page of the official website for ticket updates. Not sure why they couldn’t allow for bookings further in advance than they currently seem to be doing but who am I to judge. Anyway even if you don’t fancy walking this pathway there is every reason to visit this area which is within an hour of many of the popular resorts of the Costa del Sol with great access by road and daily (though limited) rail services. By Car: Leave Malaga on the A-357 heading for Ardales then branch off on to the A-6117 through Alora. The journey is about 56km and shouldn’t take more than an hour. There are plenty places to explore in the area and you might consider driving back via Antequera returning on the A-45. By Train: There is a train station at El Chorro but few services operate from Malaga so you’ll need to plan your journey carefully. There’s currently a train leaving Malaga’s María Zambrano station at around 10am to El Chorro with the return departing around 6pm which are ideal times for a good day out. Please confirm precise times on the official RENFE website (in English). The journey takes around 45 minutes each way. If you’re back at the station early for your return train be sure to have a drink at the station’s lovely cafe which has fabulous views of the surrounding area. 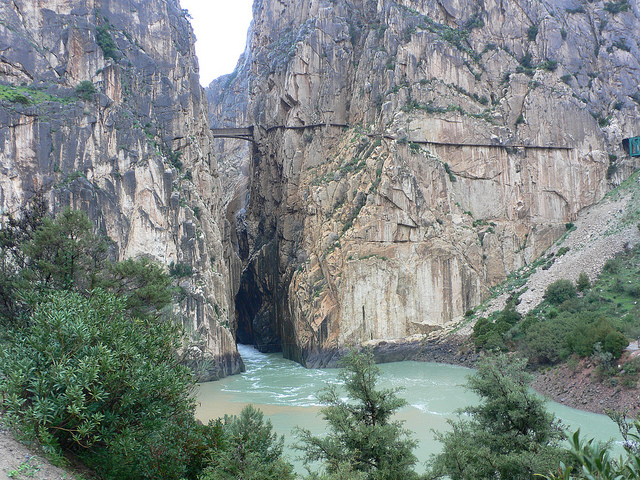 There are plans to rename the station ‘El Chorro – Caminito del Rey’. If you do want to walk the Caminito then, as previously mentioned, you’ll need to get tickets in advance. The walk can be accessed from either Ardales in the north or Alora in the south and can be walked in either direction. However, visitor numbers are being limited to 50 every thirty minutes with a maximum of 600 people being allowed in any one day. In total the walk is almost 8km, children under eight years of age are not permitted and realistically the walk cannot be recommended to anyone with any tendencies towards vertigo. They may well have done a great job of making this a safe adventure but that still doesn’t change the fact that you’ll be looking down on sheer 100 metre drops in places. The walk is linear so you will not end up where you started, coaches are available to return walkers to their starting point or you can choose to walk back from where you came. The gorge remains a very popular destination for experienced rock climbers though climbing insurance is obligatory and must be presented at the information office before beginning an ascent. If you take a look at the photos on the Expert Vagabond website you’ll get some idea of how the pathway looks from a climber’s point of view. The reopening of the Caminito del Rey has attracted enormous attention, hence the walk is fully booked for the months ahead. Tickets to do the walk will become more readily available once the initial novelty wears off. In the meantime many infrastuctural improvements are underway including improved access roads and better parking facilities so it would be a good idea to put on hold any plans to walk El Caminito for a little while. One of my favourite ‘get away from it all’ trips from our home on the Costa Tropical was to throw the kayaks onto the roof rack of the car and head for the campsite at El Chorro where we spent a few days on the waters of the reservoir and wandering the local countryside. The nearby village of Ardales is a lovely place to drop into for a drink in the main square surrounded by locals playing dominoes. Also look out for signs to the 9th century Mozarabic ruins at Bobastro from where Ibn Hafsun, a Robin-Hood like character, once controlled an area extending from Gibraltar to Jaén. If you have a car then it’s well worth visiting the town of Antequera on your way back to Malaga as it has a fine selection of historic attractions together with one of Spain’s most impressive bullrings. The national park of El Torcal nearer Malaga is also highly recommended thanks to its fabulous rock formations, its colonies of Griffon vultures and if you’re lucky you might catch sight of some Andalucian mountain goats. 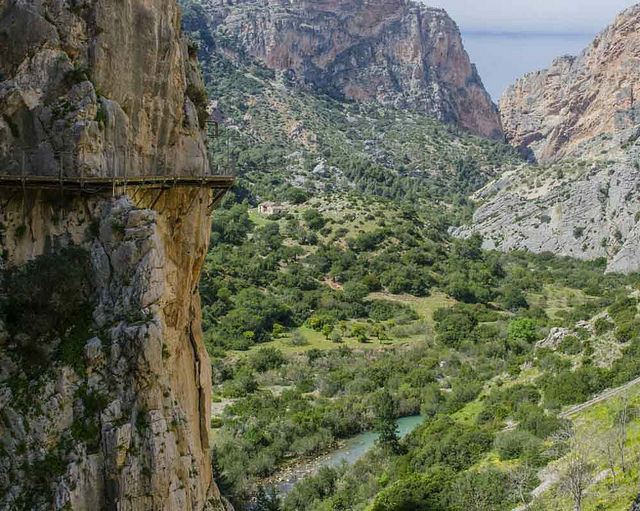 Have You Ever Seen El Caminito del Rey? Have you been to this lovely area around El Chorro Gorge … Malaga’s Lake District? Do you think you’ll fancy taking on what became one of the world’s most treacherous pathways before its restoration? Any comments or travel tips for your fellow readers are always welcome below. Holiday from hell! Way too scary! I have visited the area of Ardales recently. Last time I stayed in El Molino del Conde Hotel, which has an excellent location to walk around the embalse, enjoy the good restaurants in the area and the hotel receptionist was very helpful pointing out the best walking routes. We went on an easy ramble/hike with fantastic views of the lake, which then takes you all the way up to el caminito (which we didn’t do!) We also hired a beach pedalo which was a fantastic way of seeing the lake and also enjoying some quiet spots for swimming in. Teba with its historic Castle is also a short drive away with an interesting history to do with Scots, Crusaders and Moors – the perfect ingredients for a film I think! Thanks Natash – I forgot to mention Teba – interesting village. Will check out that hotel next time I’m there. Thanks for the info and pictures Gerry but it’s not for me. I’m afraid of heights and would be petrified on that very tiny ledge. Wed 22 Apr my wife & I will be visiting some long time friends who have lived for 9 years in Murcia near Cehegin. do you know the area? Not familiar with there Bryan. Sorry.